Don’t worry about using big, impressive words. Worry about using the right word. There is no intrinsic value in obscure, multi-syllabic words (unless you’re writing an SAT essay). That doesn’t mean you should avoid fancy words either: intrinsic, obscure, and multi-syllabic, for example, are good, fancy words. Don’t choose a word just to wow the reader. Choose the word that best expresses your meaning. 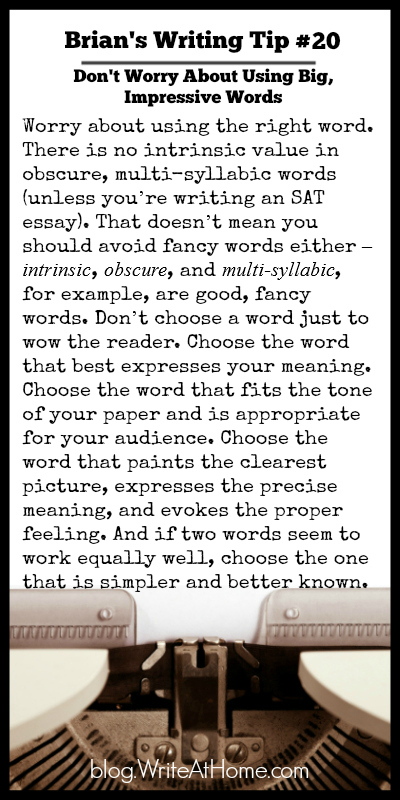 Choose the word that fits the tone of your paper and is appropriate for your audience. Choose the word that paints the clearest picture, expresses the precise meaning, and evokes the proper feeling. And if two words seem to work equally well, choose the one that is simpler and better known. I’d love to hear from you. Leave your comments below. People abuse to-be verbs in their writing, and they need to stop abusing them now. They should always use strong verbs, not weak verbs when they write. Show, do not tell!